In this Japanese name, the family name is Miyazawa. Kiichi Miyazawa (宮澤 喜一, Miyazawa Kiichi, 8 October 1919 – 28 June 2007) was a Japanese politician and the 78th Japanese Prime Minister serving from 5 November 1991 to 9 August 1993. Miyazawa was born into a wealthy, politically active family in Fukuyama, Hiroshima, on 8 October 1919. His father was a member of the Diet and his grandfather a cabinet minister. He graduated from Tokyo Imperial University with a degree in law. In 1942, he joined the ministry of finance, avoiding military service during World War II. In 1953, he was elected to the upper house of the Diet of Japan, where he stayed until moving to the lower house in 1967. Miyazawa held a number of prominent public positions, including minister of international trade and industry (1970–1971), minister of foreign affairs (1974–1976), director general of the economic planning agency (1977–1978), and chief cabinet secretary (1984–1986). He became minister of finance under the government of Noboru Takeshita in July 1986. However, Miyazawa had to resign amid the Recruit scandal in 1988. Miyazawa became Prime Minister on 5 November 1991 backed by his faction. Miyazawa gained brief fame in the United States when President George H. W. Bush vomited in his lap and fainted during a state dinner on 8 January 1992. His government passed a law allowing Japan to send its forces overseas for peacekeeping missions as well as negotiating a trade agreement with the United States. It also introduced financial reforms to address the growing economic malaise in Japan in the 1990s. Miyazawa resigned in 1993 after losing a vote of no confidence marking an end to 38 years of Liberal Democratic Party government. The reason for the vote was a scandal involving Fumio Abe, a member of Miyazawa's faction. 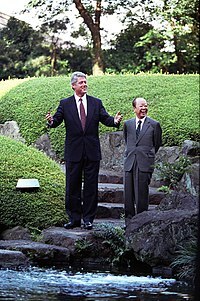 The Liberal Democratic Party returned to power in June 1994. Miyazawa later returned to frontbench politics when he was once again appointed finance minister from 1998 to 2001 in the governments of Keizō Obuchi and Yoshirō Mori. In 1998, Miyazawa replaced Hikaru Matsunaga as finance minister. He served a total 14 terms in both upper and lower houses before retiring from politics in 2003. The reason for his retirement was that then prime minister Junichiro Koizumi set an age limit of 73 for LDP political candidates. Miyazawa married while studying in the United States. He and his wife, Yoko, had two children: Hiro, an architect, and Keiko, wife of diplomat Christopher J. Lafleur. He published a book, entitled Secret Talks Between Tokyo and Washington, which was translated into English by Robert D. Eldridge in 2007. The book is about Miyazawa's views concerning the relationships between the US and Japan in terms of the political, economic, and security-related negotiations during the period of 1949 and 1954. Miyazawa died in Tokyo at the age of 87 on 28 June 2007. ^ a b c d Martin, Douglas (29 June 2007). "Kiichi Miyazawa, Japan Premier in the 90s, Dies at 87". New York Times. Retrieved 8 October 2018. ^ Calder, Kent E. (January 1992). "Japan in 1991: Uncertain Quest for a Global Role". Asian Survey. 32 (1): 32–41. doi:10.1525/as.1992.32.1.00p0124h. JSTOR 2645196. ^ a b c d e f McCurry, Justin (30 June 2007). "Obituary. Kiichi Miyazawa". The Guardian. Retrieved 5 January 2013. ^ a b Jameson, Sam (2 February 1992). "Miyazawa's Party Faction Chief Indicted". Los Angeles Times. Tokyo. Retrieved 11 January 2013. ^ "Matsunaga expects economy to recover under Miyazawa". Kyodo News. Tokyo. 30 July 1998. Retrieved 5 January 2013. ^ "Kiichi Miyazawa: plagued by bribery". BBC. 29 July 1998. Retrieved 11 January 2013. ^ a b "Former Japan PM Kiichi Miyazawa dead". UPI. Tokyo. 28 June 2007. Retrieved 11 January 2013. ^ Nakamoto, Michiyo (28 June 2007). "Former Japanese PM Miyazawa dies". Financial Times. Tokyo. Retrieved 5 January 2013. ^ Secret Talks Between Tokyo and Washington. Google Books. Retrieved 5 January 2013. This page is based on the Wikipedia article Kiichi Miyazawa; it is used under the Creative Commons Attribution-ShareAlike 3.0 Unported License (CC-BY-SA). You may redistribute it, verbatim or modified, providing that you comply with the terms of the CC-BY-SA.